The Import feature of the WAVE Portal allows you to upload a CSV file of TLK 100 units. You can perform an Import at any time, but if the entries are duplicated, they will not be added. In general, you will need to download the devices.csv file, edit it in a spreadsheet to include the users you want to add, save the spreadsheet as a comma-delimited .CSV file, and then upload the file. If you already have a .CSV file saved in Excel format, you may edit that file to included new users. Existing users will be ignored and will not be duplicated. When you register a TLK 100, a license is automatically added to your monthly subscription. If you intend to use the same CSV file to maintain TLK 100s, then maintain the file in Excel format. Save the file as a .CSV file when you are ready to import it but keep the .XLS file for later editing. TLK 100s can be added by uploading a .CSV file but they cannot be removed. If you remove a TLK 100 from the list, it will not be removed from the Customer. To remove a TLK 100 you must manually delete the TLK 100. Deleting a TLK 100 is done by selecting the device and then clicking Delete from the Actions menu. Login to the WAVE Portal using your Customer account credentials. In the left navigation frame, the TLK 100s menu option is now available. Click the TLK 100s menu. The TLK 100s page opens displaying all registered TLK 100 devices. Click the Register TLK 100s button. Click the CSV TEMPLATE button to download a CSV Template for entering your TLK 100 information. Navigate to your Downloads folder and open the devices.csv template file using Microsoft Excel. Edit the file to add the IMEI, Serial Number, and Display Name for all the TLK 100 devices you wish to register. 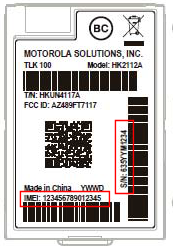 You will find the Serial Number and IMEI number you need to register the device on the box of eachTLK 100 unit. Record the IMEI and the S/N numbers. If you do not have the box, then alternatively you can identify the IMEI and S/N numbers from the label under the battery. In the IMEI field, enter the IMEI value of the TLK 100 to register. In the Serial Number field, enter the S/N of the TLK 100 to register. In the Display Name field, enter a Display Name for this unit. The Display Name will be the User Name for this device in the WAVE Portal and appear in the Users menu as a TLK 100 unit. The Display Name is also the Alias and will appear to other users when this unit transmits. Once your file is ready, click the Choose File or Browse button. (Click the IMPORT button if you have closed the import window). Browse to the .CSV file you saved from the Excel template and select the file. The TLK 100s page reappears with the newly added units visible on the page.